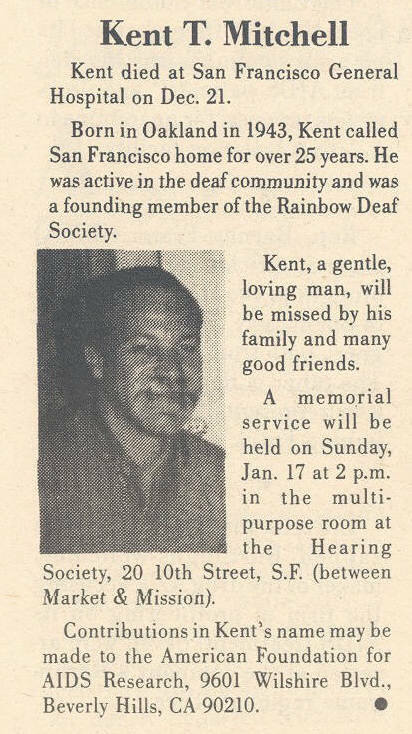 Kent died at San Francisco General Hospital on Dec. 21. Born in Oakland in 1943, Kent called San Francisco home for over 25 years. 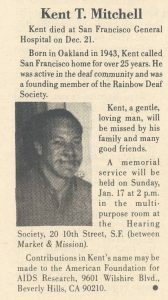 He was active in the deaf community and was a founding member of the Rainbow Deaf Society. Kent, a gentle, loving man will be missed by his family and many good friends. A memorial service will be held on Sunday, Jan. 17 at 2 p.m. in the multi-purpose room at the Hearing Society, 20 10th Street S.F. (between Market & Mission). Contributions in Kent’s name may be made to the American Foundation for AIDS Research 9601 Wilshire Blvd., Beverly Hills, CA 90210.